The present feasibility study focuses on Health-Related Quality of Life (HRQOL) and life satisfaction of parents of children with chronic conditions. 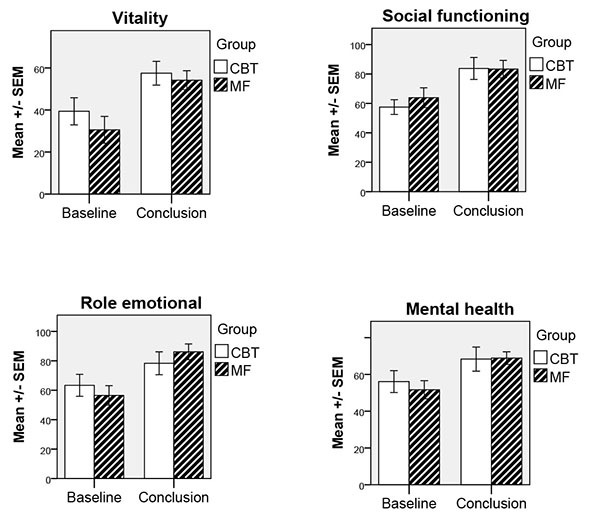 The study was conducted using a repeated measures design and applied either group-based cognitive behavioural therapy (CBT; n = 10) or a group-based mindfulness programme (MF; n = 9). The study participants were wait-listed for six months. The results indicate improvements for participants in both treatment groups regarding certain areas of HRQOL and life satisfaction. After eight group therapy sessions, parents in the two treatment groups significantly improved their Mental Component Summary (MCS) scores as well as their scores on the mental subscales Vitality, Social functioning, Role emotional and Mental health. In addition, some of the physical subscales, Role physical, Bodily pain and General health, showed considerable improvement for the MF group. When testing for clinical significance by comparing the samples with mean values of a norm population, the MCS scores were significantly lower at pre-measurements, but no significant differences were observed post-measurement. For the Physical component summary (PCS) scores, a significantly higher score was observed at post-measurement when compared to the norm population. Moreover, the results indicate improvement in life satisfaction regarding Spare time, Relation to child and Relation to partner. The study concludes that CBT and mindfulness may have a positive effect on areas of HRQOL and life satisfaction. Keywords: Cognitive behavioural therapy, Mindfulness, Parents of disabled children, Health-related quality of life, Life satisfaction. When a child is diagnosed with a chronic disease and/or functional disability, the family is plunged into a crisis. Parents in these families often worry about their child’s health and well-being and feel overwhelmed and stressed by the pressure to secure the help and support that the family is entitled to . Several studies show that these parents frequently suffer from psychological problems such as stress-related disorders, compulsive thought patterns, evasion, insecurity, despondency, fears and reduced quality of life [1-5]. These symptoms are overrepresented in parents of children with chronic disorders . It is likely that the long-term stress caused by having a chronically ill or disabled child can result in some form of chronic stress reaction or burnout syndrome, which may have serious consequences [6-9]. In addition, being a parent of a child with a chronic condition can negatively affect Health-Related Quality of Life (HRQOL), and each disease presents unique challenges . For example, parents of asthmatic children have poor HRQOL - especially in the emotional domain, affecting their social life . Further, mothers, but not fathers, of children with autism spectrum disorders have reported impaired HRQOL, and there is a relationship between maternal well-being and child behaviour characteristics . Valid measurements of HRQOL are important in healthcare and research [13-15]. The HRQOL represents how patients perceive of the functional effect of an illness or a medical condition and the consequent therapy . The HRQOL is thus subjective and multidimensional, encompassing physical and occupational function, psychological state, social interaction and somatic sensation . Clinical trials can also use subjective outcome measures - such as the HRQOL - that show responsiveness to important changes in patients’ everyday functioning and well-being. Moreover, nowadays patient-reported outcome of treatment efficacy is adequately standardised for scientific reviews according to the conventional criteria of evidence-based medicine . An unpublished study by us (submitted) shows that cognitive behavioural therapy (CBT) and mindfulness (MF) can be effective and efficient interventions. The results of that study demonstrate that perceived stress and the degree to which situations are perceived as stressful - based on factors such as emotional exhaustion and physical fatigue, listlessness, tension and cognitive weariness - decrease significantly irrespective of the form of treatment received (CBT or MF). However, the health-related quality of life consequences from these CBT and MF interventions are still unknown. The purpose of this feasibility study was to examine health-related quality of life and life satisfaction of parents of children with chronic conditions before and after completed cognitive behavioural therapy (CBT) or mindfulness (MF) intervention. We advertised for participants in the local press. Parents of children younger than 18 years with chronic conditions (e.g. diabetes, cancer, autism, ADHD or mental retardation) suffering from stress and burnout symptoms were invited to participate in the study. To be eligible for this study, the participants had to have a score exceeding 25 points on the Perceived Stress Scale or an average of above 2.75 points on the Shirom-Melamed Burnout Questionnaire [7, 19, 20]. Parents with a poor knowledge of Swedish (i.e. who could not fill out the questionnaires without an interpreter) were excluded from the study, as were those undergoing psychological treatment. However, parents already undergoing drug therapy for anxiety/mood disorder were not excluded. Initially, 28 participants were recruited, 19 of whom completed the treatment and were included in the analysis. Nine participants (32.1%) dropped out of the study before its completion: seven withdrew during the initial phase, two during the treatment phase. The participants’ ages ranged from 36-54 years (CBT, 36-45 years, mean 40.4; MF, 41-54 years, mean 46.3). In all, 17 of the 19 participants were women: 9 out of 10 for the CBT group, 8 out of 9 for the MF group. Twelve of them (5 in CBT and 7 in MF) had more than 4 terms of academic education. The CBT group’s children were 1-15 years old, with a mean age of 9.9 years; the MF group’s children were 6-18 years of age, with a mean age of 11.4 years. The children’s types of diagnoses were distributed as follows for Somatic illness/Psychiatric illness/Both: 1/6/3 (CBT) and 2/6/1(MF). Study design. A two-group quasi experimental design with baseline and post-intervention measurements was used to compare two different randomised intervention groups. The participants were wait-listed for six months before being randomised into either the structured CBT intervention group (n = 10) or the structured MF intervention group (n = 9). The duration of the group treatments was eight weeks, with two-hour weekly sessions. The two study-therapists conducting the respective intervention wrote a brief summary of each session afterwards, and a certified therapist supervised them twice. Both study-therapists had undergone basic CBT training, and the one in charge of the MF intervention was a step 1 mindfulness instructor. The CBT intervention was based on cognitive theory [21, 22] to alter thoughts and emotions regarding stress-related problems [21, 23] as well as on behavioural techniques to increase behavioural change [21, 22]. 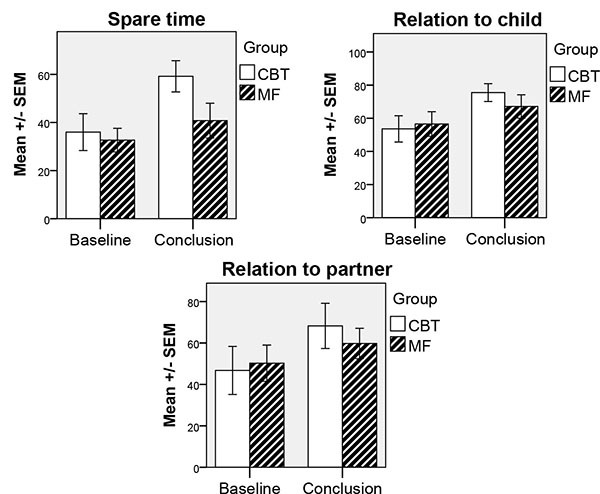 The exercises used were obtained from the Acceptance and Commitment Therapy , but the techniques promoting acceptance strategies were excluded from the CBT intervention because of overlap with the MF programme . The present authors - with experience of both CBT and of this particular population from previous research and clinical work - developed the CBT intervention based on the findings of Grossi  and Anclair and Hiltunen  and structured it as follows: Introduction to stress and burnout; Formulation of personal goals with the intervention; On thoughts, cognitive biases and negative automatic thoughts; On emotions; Problem solving; Valued direction; Activity/tension, relaxation and recovery; Moving on. Also, the CBT group participants committed to doing home assignments for 15 minutes per day. The structured MF programme utilised was the Here and Now Version 2.0 . The programme includes eight sessions, and each session has a main theme: Get to know your body - Body scan; Observe your breathing - Breathing anchor; Be aware of breathing and body movement; Here-and-now sitting meditation; Acceptance: Stop, observe, accept, respond and let go; Coping with difficulties; Thoughts are not facts; Reinforce your daily training and take care of yourself. In addition, the MF group participants committed to perform daily homework for 15 minutes using self-instructional material. For this purpose, they received a CD with guided assignments at the beginning of treatment. The parents filled out a questionnaire at the start and end of the intervention. The HRQOL was measured with the Short-form 36 (SF-36), which is a validated, well-known and widely used generic quality of life questionnaire with good reliability [28-31]. It consists of 36 questions measuring eight dimensions of quality of life: four highlight physical function and four mental function. The eight dimensions are Physical functioning (PF), Role functioning - physical causes (RP), Bodily pain (BP), General health (GH), Vitality (VT), Social functioning (SF), Role functioning - emotional causes (RE) and Mental health (MH). Furthermore, Physical Component Summary (PCS) and Mental Component Summary (MCS) scores were calculated. According to Sullivan et al. , 80-85% of the total variance in the eight subscales can be explained by the two summary scores. All SF-36 measurements are norm-based, with the general population mean equal to 50 and the standard deviation equal to 10. A questionnaire was created where clients answered questions about their satisfaction of life. The questionnaire had questions about the clients’ spare time, relation to child, relation to partner, relation to friends, and satisfaction with work. Respondents rated their experiences on visual analogue scales of 0-10 centimetres where 0 equals “not satisfied at all” and 10 equals “very satisfied”. Participant results of the SF-36 MCS scores before and after therapy indicated that there had been considerable improvement (Wilcoxon signed-rank test) from the beginning of the therapy to its conclusion for both treatments (CBT: z = -2.55, P = .01; MF: z = -2.31, P = .02). However, the results of the SF-36 PCS scores before and after therapy showed no significant improvement, that is, the effect of treatment was the same irrespective of the form of treatment received. When testing for clinical significance (Table 1) by comparing the samples with mean values of a norm population (one-sample t-tests), MCS scores were significantly lower at pre-measurements for the CBT and MF groups, but no significant differences were observed for post-measurements. For the PCS post-measurement of MF, a significantly higher score was observed when compared to norm population (c.f. Table 1). The results of the SF-36 MCS scores are illustrated graphically in Fig. (1). Fig. (1). MCS means (+/- S.E.M.) for CBT and MF participants before and after therapy. Table 1. Comparison of CBT and MF groups with a norm population (N=8930). Norms (mean and C.L.) for the general Swedish population according to Sullivan et al. are: MCS-total 50.0 (49.8-50.2), MCS-males 50.7 (50.4-51.0) and MCS-females 49.4 (49.0-49.7). 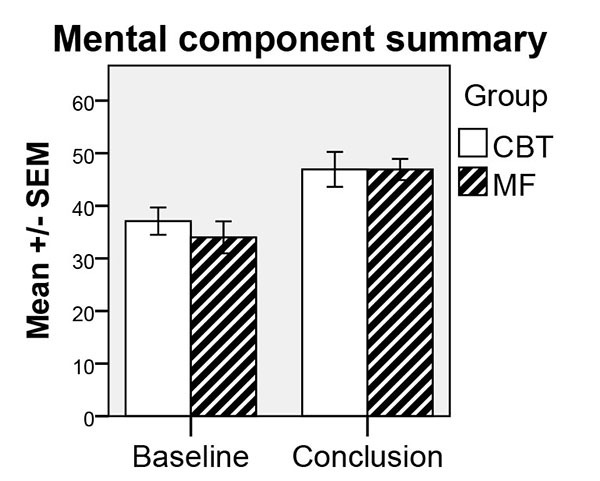 Participants’ results on the SF-36 mental scales showed substantial improvements from before therapy to after therapy, meaning that the treatment effect was similar for CBT and MF in this respect. Wilcoxon signed-rank tests showed significant effects for time for the following dimensions and groups: Vitality (CBT: z = -2.69, P = .007; MF: z = -2.32, P = .02), Social functioning (CBT: z = -2.53, P = .01; MF: z = -2.22, P = .03), Role emotional (MF: z= -2.02, P = .04), and Mental health (CBT: z = -2.40, P = .02; MF: z = -2.40, P = .02). A tendency to significant effect was also seen for the CBT group in the dimension Role emotional (z = -1.86, P = .06). The results of the SF-36 mental scales are illustrated graphically in Fig. (2). When testing for clinical significance by comparing the samples with mean values from a norm population, significantly lower pre-measurements were observed in both groups for dimensions Vitality, Social functioning, Role emotional, and Mental health, whereas at post-measurement only the dimension Mental health was lower for both groups compared to norm values (c.f. Table 1). Participants’ results on the SF-36 physical scales before and after treatment generally showed to be similar (Wilcoxon signed-rank test). The only exception was the MF group, which had improved from before treatment in the dimensions Role physical (z = -1.93, P = .05), Bodily pain (z = -2.04, P = .04) and General health (z = -2.32, P = .02). A tendency to significant effect was also seen for the CBT group in the dimensions Role physical (z = -1.79, P = .07) and General health (z = -1.79, P = .07). When testing for clinical significance by comparing both groups with a norm population, it could be concluded that our sample did not differ from the norm population on physical dimensions of SF-36 except in the General health dimension where both groups scored lower at pre-measurement but scored normally at post-measures (c.f. Table 1). The results for the SF-36 physical scales are illustrated graphically in Fig. (3). Fig. (2). Mental scales means (+/- S.E.M.) for CBT and MF participants before and after therapy. Fig. (3). Physical scales means (+/- S.E.M.) for CBT and MF participants before and after therapy. For life satisfaction, considerable improvements (Wilcoxon signed-rank test) had taken place during the therapy for the scales Spare time (CBT: z = -1.99, P = .05), Relation to child (CBT: z = -2.40, P = .02; MF: z = -2.20, P = .03) and Relation to partner (CBT: z = -2.52, P = .01). The results for life satisfaction are illustrated graphically in Fig. (4). Fig. (4). Satisfaction with life scales means (+/- S.E.M.) for CBT and MF participants before and after therapy. The feasibility of CBT and Mindfulness interventions for parents of children with chronic conditions were studied with a focus on health-related quality of life and life satisfaction. The results indicate significant improvements for parents in the two treatment groups regarding MCS scores, Vitality, Social functioning, and Mental health. 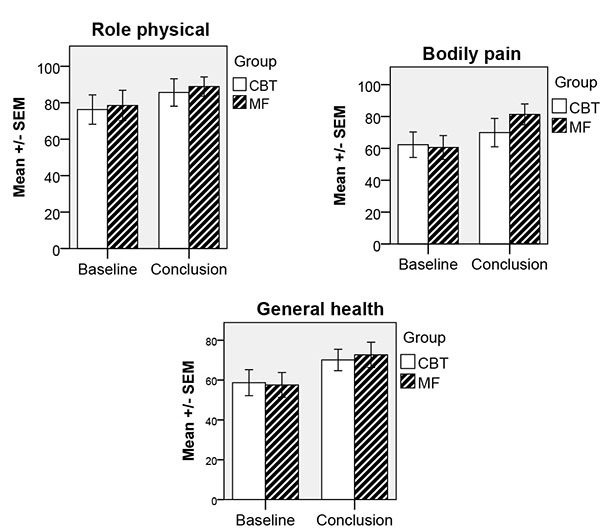 For the MF group, improvements could also be seen for Role emotional as well as in the physical dimensions: Role physical, Bodily pain and General health. No significant effects were found for the other variables relating to physical health (PCS scores and Physical functioning). Moreover, improvements in life satisfaction regarding Spare time and Relation to partner were also seen for the CBT group, and both groups improved their life satisfaction with regard to Relation to child. These results strongly agree with our previous study (submitted) showing that perceived stress and the degree to which situations are perceived as stressful decrease significantly for factors such as emotional exhaustion and physical fatigue, listlessness, tension and cognitive weariness - irrespective of CBT or MF being the treatment received. Since 17 of our participants were women, our results are well in line with previous research reporting that mothers of children with Asperger syndrome and/or high functioning autism have lower SF-12 scores (Short Form Health Survey) compared to the controls, indicating poorer physical health . Moreover, a relationship between maternal well-being and child behaviour characteristics has been observed . Other studies have also shown that mothers' mental health is related to the child's disability [32-36]. Mothers of children with intellectual disabilities more often report greater parenting demands, increased stress levels and poorer physical and psychological health than do parents of non-disabled children [37-41]. No health-related data has been collected before treatment start although the participants were waitlisted for six months. A previous study by Devilly and McFarlane  shows that clients on a waiting list can improve over time through, for example, spontaneous remission, increased self-confidence after therapeutic contact, expectancy effects and a greater understanding of one’s own problems after having received structured assessment. The study also shows that the combination of expectancy effects and an initial problem assessment interview results in a reduction of symptoms. In the present study, we cannot exclude the possibility of some spontaneous remission during baseline; however, at the start of therapy, the participants were still below the cut-off levels for a Swedish normal population regarding the HRQOL dimensions. Furthermore, as demonstrated in our previous study of the same participants (submitted), they showed approximately the same level of perceived stress and burnout at the two baseline assessments. Except for General health, no significant effects are found for the physical variables which can be explained by the fact that the participants scored on, or slightly below, the Swedish norm value  already at the beginning of this study. Further, the present interventions had no primary focus on physical aspects. In addition, the results of the present article show low satisfaction of life initially and improvement over time regarding parents’ Spare time, Relation to child, and Relation to partner. These results are partly in agreement with the findings of Lawoko and Soares [43, 44] which showed that parents of children with congenital heart disease or other diseases have a lower quality of life compared with parents of healthy children. Their studies show that mothers report lower quality of life than fathers and that reduced quality of life depends on care-giving time, sick-leave, retirement, financial difficulties, distress (GSI), hopelessness and social isolation [43, 44]. In the present study, a possible reason for the parents’ improvement both in mental health and in general health may be that, as a result of the intervention, they can access their strengths and functional and flexible actions to better manage the demands and additional stressors that come with being a parent of a child with a chronic condition. This feasibility study has certain limitations such as the sample size and the power to detect a reasonably sized interaction. Further, no control group was available; however, we still had the possibility to compare data from our sample with the Swedish norm population. For these reasons, the present results should be replicated in a reasonably sized and controlled RCT study. The study was approved by the regional Ethics Board, approval number 2011/358. Written informed consent was collected from all participants. All Human research procedures followed were in accordance with the standards. Whalen CK, Odgers CL, Reed PL, Henker B. Dissecting daily distress in mothers of children with ADHD: an electronic diary study. J Fam Psychol 2011; 25(3): 402-11. Anclair M, Hovén E, Lannering B, Boman KK. Parental fears following their childs brain tumor diagnosis and treatment. J Pediatr Oncol Nurs 2009; 26(2): 68-74. Boman KK, Viksten J, Kogner P, Samuelsson U. Serious illness in childhood: the different threats of cancer and diabetes from a parent perspective. J Pediatr 2004; 145(3): 373-9. Farnik M, Brożek G, Pierzchała W, Zejda JE, Skrzypek M, Walczak Ł. Development, evaluation and validation of a new instrument for measurement quality of life in the parents of children with chronic disease. Health Qual Life Outcomes 2010; 8: 151. Lindström C, Aman J, Norberg AL. Increased prevalence of burnout symptoms in parents of chronically ill children. Acta Paediatr 2010; 99(3): 427-32. Appels A, Schouten E. Burnout as a risk factor for coronary heart disease. Behav Med 1991; 17(2): 53-9. Melamed S, Kushnir T, Shirom A. Burnout and risk factors for cardiovascular diseases. Behav Med 1992; 18(2): 53-60. Toker S, Shirom A, Shapira I, Berliner S, Melamed S. The association between burnout, depression, anxiety, and inflammation biomarkers: C-reactive protein and fibrinogen in men and women. J Occup Health Psychol 2005; 10(4): 344-62. Epstein I, Stinson J, Stevens B. The effects of camp on health-related quality of life in children with chronic illnesses: a review of the literature. J Pediatr Oncol Nurs 2005; 22(2): 89-103. Reichenberg K, Broberg AG. The paediatric asthma caregivers quality of life questionnaire in swedish parents. Acta Paediatr 2001; 90(1): 45-50. Allik H, Larsson JO, Smedje H. Health-related quality of life in parents of school-age children with Asperger Syndrome or High-Functioning Autism. Health Qual Life Outcomes 2006; 4: 1-8. Finkelstein FO, Wuerth D, Finkelstein SH. Health related quality of life and the CKD patient: challenges for the nephrology community. Kidney Int 2009; 76(9): 946-52. Schatell D, Witten B. Measuring Dialysis Patients’ Health-Related Quality of Life with KDQOL-36. Centers for Medicare & Medicaid Services 2008. Available from: http://wwww.kdqol-complete.org/pdfs/kdqol-36.pdf. Sullivan M. Livskvalitetsmätning i klinisk vårdforskning bättre instrument än traditionella resultatmått. Lakartidningen 1990; 87(16): 1369-72. Frank A, Auslander GK, Weissgarten J. Quality of life of patients with end-stage renal disease at various stages of the illness. Soc Work Health Care 2003; 38(2): 1-27. Schipper H, Clinch JJ, Olweny CL, Eds. Quality of life studies: definitions and conceptual issues. Philadelphia: Lippincott-Raven Publishers 1996. Sullivan M, Tunsäter A. Health-related quality of life informative as outcome measure in clinical studies Practical example: asthma/chronic obstructive pulmonary disease. Lakartidningen 2001; 98: 4428-33. Cohen S, Kamarck T, Mermelstein R. A global measure of perceived stress. J Health Soc Behav 1983; 24(4): 385-96. Melamed S, Ugarten U, Shirom A, Kahana L, Lerman Y, Froom P. Chronic burnout, somatic arousal and elevated salivary cortisol levels. J Psychosom Res 1999; 46(6): 591-8. Almén N. Stress- och utmattningsproblem: Kognitiva och beteendeterapeutiska metoder. Lund: Studentlitteratur AB 2007. Grossi G. Hantera din stress: Med kognitiv beteendeterapi. Stockholm: Viva 2008. O'Donohue WT, Fisher JE. Cognitive behavior therapy: applying empirically supported techniques in your practice. 2nd ed. Hoboken, New Jerry: John Wiley & Sons, Inc. 2008. Hayes SC. Acceptance and commitment therapy, relational frame theory, and the third wave of behavioral and cognitive therapies. Behav Ther 2004; 35(4): 639-65. Hayes SC, Luoma JB, Bond FW, Masuda A, Lillis J. Acceptance and commitment therapy: model, processes and outcomes. Behav Res Ther 2006; 44(1): 1-25. Anclair M, Hiltunen AJ. Cognitive behavioral therapy for stress-related problems: two single-case studies of parents of children with disabilities. Clin Case Stud 2014; 13(6): 472-86. Schenström O. Här and NU version 2.0 [Here and Now version 2.0]. Sweden: Mindfulnesscenter AB 2011. (AudioBook). Dempster M, Donnelly M. Measuring the health related quality of life of people with ischaemic heart disease. Heart 2000; 83(6): 641-4. Sullivan M, Karlsson J. The Swedish SF-36 Health Survey III. Evaluation of criterion-based validity: results from normative population. J Clin Epidemiol 1998; 51(11): 1105-13. Sullivan M, Karlsson J, Taft C. Hälsoenkät: Svensk Manual och Tolkningsguide, 2:a upplagan. 2nd ed. Gothenburg: Sahlgrenska University Hospital Swedish Manual and Interpretation Guide 2002. Ware JE Jr, Gandek B. Overview of the SF-36 Health Survey and the International Quality of Life Assessment (IQOLA) Project. J Clin Epidemiol 1998; 51(11): 903-12. Brehaut JC, Kohen DE, Raina P, et al. The health of primary caregivers of children with cerebral palsy: how does it compare with that of other Canadian caregivers? Pediatrics 2004; 114(2): e182-91. Emerson E. Mothers of children and adolescents with intellectual disability: social and economic situation, mental health status, and the self-assessed social and psychological impact of the childs difficulties. J Intellect Disabil Res 2003; 47(Pt 4-5): 385-99. Fisman S, Wolf L. The handicapped child: psychological effects of parental, marital, and sibling relationships. Psychiatr Clin North Am 1991; 14(1): 199-217. Hedov G, Annerén G, Wikblad K. Self-perceived health in Swedish parents of children with Downs syndrome. Qual Life Res 2000; 9(4): 415-22. Seltzer MM, Greenberg JS, Floyd FJ, Pettee Y, Hong J. Life course impacts of parenting a child with a disability. Am J Ment Retard 2001; 106(3): 265-86. Olsson MB, Hwang CP. Depression in mothers and fathers of children with intellectual disability. J Intellect Disabil Res 2001; 45(Pt 6): 535-43. Saloviita T, Itälinna M, Leinonen E. Explaining the parental stress of fathers and mothers caring for a child with intellectual disability: a Double ABCX Model. J Intellect Disabil Res 2003; 47(Pt 4-5): 300-12. Blacher J, Neece CL, Paczkowski E. Families and intellectual disability. Curr Opin Psychiatry 2005; 18(5): 507-13. Singer GH. Meta-analysis of comparative studies of depression in mothers of children with and without developmental disabilities. Am J Ment Retard 2006; 111(3): 155-69. Miodrag N, Hodapp RM. Chapter Four - Chronic Stress and its Implications on Health Among Families of Children with Intellectual and Developmental Disabilities (I/DD). In: Disabil IR, Ed. Academic Press. Robert, MH 2011; Vol. 41: pp. 127-61. Devilly GJ, McFarlane AC. When wait lists are not feasible, nothing is a thing that does not need to be done. J Consult Clin Psychol 2009; 77(6): 1159-68. Lawoko S, Soares JJ. Distress and hopelessness among parents of children with congenital heart disease, parents of children with other diseases, and parents of healthy children. J Psychosom Res 2002; 52(4): 193-208. Lawoko S, Soares JJ. Quality of life among parents of children with congenital heart disease, parents of children with other diseases and parents of healthy children. Qual Life Res 2003; 12(6): 655-66.